Ticks are relatively small arachnids who survive by feeding off the blood of animals and humans. Ticks can pose a serious health hazard because they spread disease as they travel from host to host. The United States is home to different types of ticks, and the type you may be exposed to depends on the area of the country where you live. Deer ticks are one of the most dangerous types because they carry Lyme disease, as well as several other illnesses. 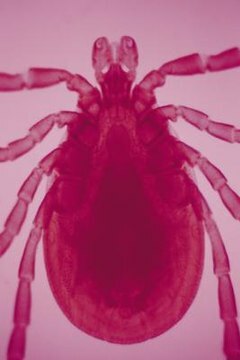 Lyme disease can have very serious health consequences for humans. Deer ticks are most often found in the northern part of the country but are a growing problem along the entire eastern seaboard. Female deer ticks are red and black in color. Male deer ticks are solid black. Deer ticks are also known as black-legged ticks. Both genders have black legs. Brown dog ticks are actually a reddish-brown color, though it is possible for some individuals to appear more red than brown. These ticks live in warm climates and can quickly infest an area once they gain access. While these ticks are called "dog" ticks, they can thrive on a variety of hosts. Brown dog ticks can spread Babesiosis and Ehrlichiosis. Babesiosis is a parasitic infection that damages your red blood cells and can cause serious anemia as well as an assortment of flu-like symptoms. Ehrlichiosis is another type of tick-borne infection that affects your blood, causing a variety of symptoms. Both of these diseases can lead to death if left untreated. The American dog tick is similar in color to the brown dog tick but the American dog tick has gray or silver mottling on its scrotum. You do not want to be a host to a tick, regardless of the type. Help prevent becoming a tick's next meal by taking precautions against them when you plan to spend time outdoors. Wear light colored clothing that will make it easier for you to spot any ticks that are crawling on you. Wear clothing that covers most of your body and fits snugly. The less skin you have exposed, the less skin you have to worry about. Avoid dense areas of vegetation and try to stick to cleared areas. Wear bug spray when you are outdoors. If you do get a tick on you, remove it as quickly as possible. Grasp the tick by the head/mouth area using a pair of tweezers and pull it straight out of your skin without twisting or bending it. The tick should pull straight out. If it doesn't, you may have to make several attempts to remove it with the tweezers before you get it all. Kill the tick by submerging it in rubbing alcohol and clean your wound thoroughly with an antiseptic. If the tick was a deer tick, meaning it was either completely black or red and black with black legs, call your doctor immediately so that he can determine whether you need antibiotics or further medical treatment. This is especially crucial if you live in an area where Lyme disease is commonly found.